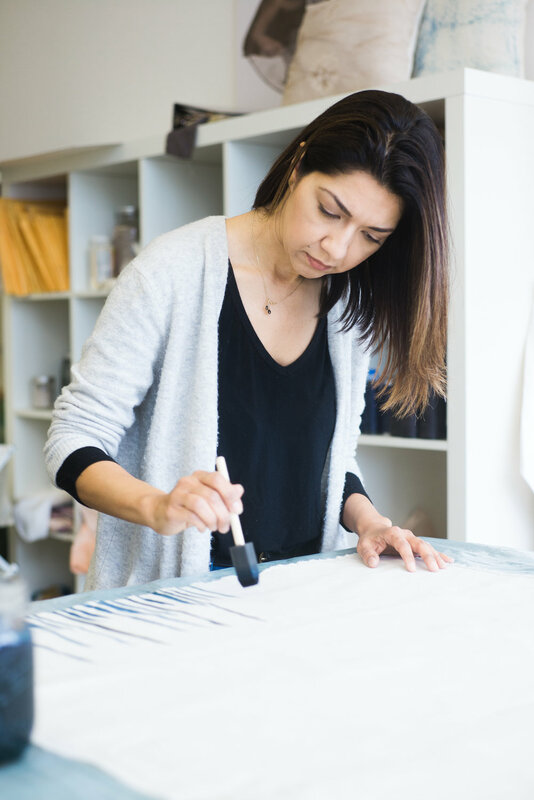 Founded in 2010 by designer Elizabeth Brunner, Piece x Piece is a carefully edited collection of clothing devoted to clean silhouettes and small scale practices with a focus on technique and detail. Materials, methods, and construction are all well considered with an appreciation for dressing simply and beautifully. Piece x Piece uses natural dyes and fibers, and every piece is dyed by hand in small batches creating original variations in each piece of fabric. The natural fibers of Piece x Piece clothing do not require dry cleaning. (However, to keep them at their best it is recommend.) If you choose to wash your garment at home please do so with the utmost care, only using cold water with gentle detergent. Do NOT wring water out; lay on a clean dry towel and gently roll the excess water out. Lay flat to dry completely. To care for your home goods, launder in cold water with like colors using mild detergent, no bleach. Tumble dry low and iron as needed or skip for a more relaxed look. Textile artist Elizabeth Brunner is most happy when she’s deep in color. 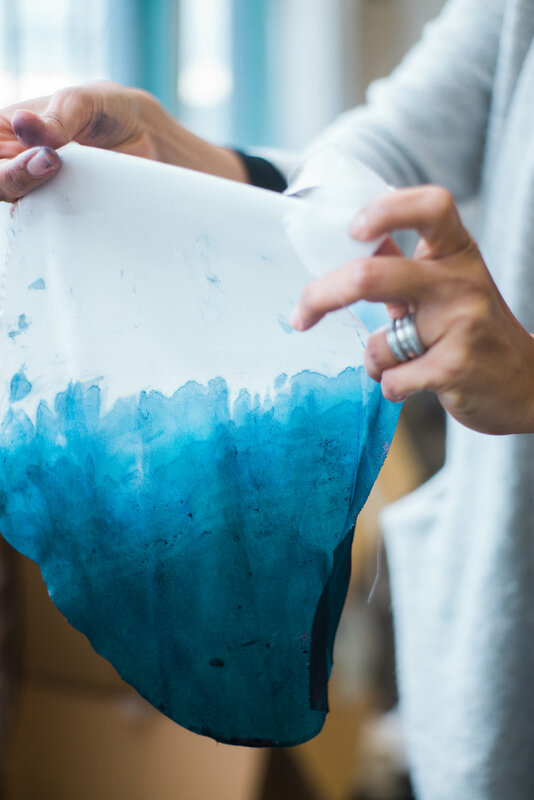 Starting her career as a fashion designer, Elizabeth quickly discovered that her creative spark lie more in the dyeing process than the pattern making and sewing. Indigo - Several species, especially Indigofera tinctoria and Indigofera suffruticosa, are used to produce indigo dye. Primary color range is deep blue to light blue. Marigiold - A plant of the daisy family, typically with yellow, orange, or copper-brown flowers, reveals many shades of orange to yellow when extracted for dyeing. Avocado skin - While avocado are commercially valuable, their skin carries it's own value in the way of natural color. The bumpy dark green skin offers many beautiful shades of pink when the skin (and pit) are boiled to release the color. Piece x Piece founder Elizabeth Brunner has been a supporter and participant in Women for Women International for nearly a decade. More than just transforming the lives of women in some of the planet’s most under-resourced and vulnerable areas, Women for Women builds personal connections between women of all ages, nationalities and religions through their powerful global network of sisterhood. Since 1993, Women for Women International has helped more than 447,000 marginalized women in countries affected by war and conflict. In eight countries they offer women support through tools, and access to life-changing skills to move from crisis and poverty to stability and economic self-sufficiency. Women for Women International brings women together in a safe space to learn life, business, and vocational skills. 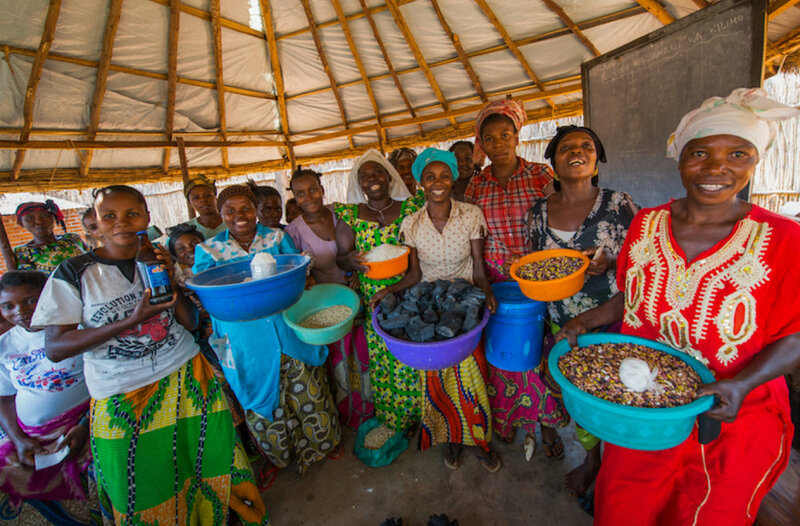 Once enrolled, each woman receives a monthly stipend – a vital element that enables her to participate in her future. Piece x Piece is proud to donate 10% of each sale directly to Women for Women.